About two months ago, I wrote an article titled “The Integrity of MMA is Being Compromised“. I wrote about the questionable hero of whom is embraced by a select group of people; Chael P. Sonnen. I took great exception to Chael being named an ultimate fighter coach, opposite light heavyweight champion, Jon Jones. To make matters worse, Chael is also slated to fight Jones for the title in April. I know it seems as though I’m dwelling on things that are out of my control; but those of you that know me, know that I have been saying for a while that the integrity of the sport is being compromised. For all of you smart alecs that question how integrity can be involved in a combat sport, I’ll make one thing perfectly clear. Title shots should go to fighters that have earned them through hard work inside the cage, not by what they do outside of it! Chael Sonnen was chosen as a title challenger over much more worthy fighters in Dan Henderson and Lyoto Machida. But that’s not what this article is about. Something far worse has happened, and is happening. The UFC is becoming a popularity contest. The fights that are being made are the fights that “everyone wants to see”. The problem is that based on what the UFC’s definition of ‘everyone’ is way off, to say the least. Here is the thing. We have a select group of vocal fans that enjoy the Chael Sonnen’s of the world. They then call for title shots for fighters that do not deserve them under any circumstances; let alone in a weight class they haven’t fought at. 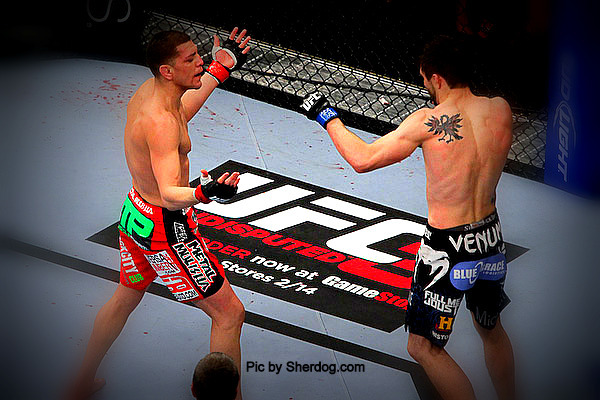 No fans are more vocal than the fans of Nick Diaz (the subject of this piece). Earlier this month, it was announced that Nick Diaz (coming off a loss, and a one year suspension), would be challenging welterweight champion Georges St. Pierre (last seen beating the man that beat the man). I’m not going to engage in any argument over who really won the fight between Condit and Diaz. I will say that Diaz officially lost that fight. I’ll leave it at that. Diaz would go on to get suspended for one year for marijuana (shockingly, he is still a role model). While Diaz has been suspended, Johny Hendricks has been destroying the opposition. While Diaz has been suspended, Hendricks has KO’d Jon Fitch and Martin Kampmann, in a combined 58 seconds! Yet, we have Firas Zahabi, GSP, Dana White, and Diaz’s 10 fans, believing that Nick Diaz deserves the title shot. Zahabi mentioned that Diaz has better wins than Hendricks. That is easily one of the most absurd things that I’ve ever heard. Diaz’s best win to date, is a win over a lightweight in B.J. Penn. As I recall, all Diaz’s fans were elated when Diaz beat Penn, but when Rory Macdonald did something similar; they criticized Rory for not finishing Penn. I wish I could record what people say, so that I may bring it up at a later time. GSP, on the other hand, is upset that Diaz is talking crap about him. Georges, what are you, five years old?! You’re a fighter, and that’s what makes you mad? GSP then tries to sell us on Diaz’s legitimacy as a contender. Georges, please don’t insult mine or anyone else’s intelligence. You are going to crush Diaz, worse than Ben Henderson did to Nick’s younger brother, Nate Diaz. And no, you did not learn how to beat a Diaz by watching Ben Henderson’s fight with Nate Diaz. We then have Dana White and his usual; this is the fight that fans want to see. Really? C’mon bro. You cannot say that the majority of the fans want to see that fight. I for one want to see GSP vs. Hendricks. If we are really making fights that “fans want to see”, why not make Silva vs. GSP? ——– I’m waiting. Exactly. You criticize boxing and their antics, yet consistently make moves like this. Let’s say for a minute that Nick didn’t smoke marijuana (trying to keep a straight face); he still has never beaten a fighter who was great at the time he fought them. Let me remind you that Nick has losses to Joe Riggs and Diego Sanchez (better off at 155). Before you say that Nick has gotten better, remember this; Nate also got better, before getting destroyed by Bendo. This leads me to the vocal group of fans. You can’t possibly believe that Nick deserves this fight, can you? You don’t see it now, but you are contributing to the decay of the sport. It won’t be a quick decay, but over time it could lead to the destruction of the sport I love more than all other sports. What we have learned is that if we talk crap, engage in fraudulent activity, smoke weed, get suspended for smoking weed, take steroids, abuse drugs; we too can have a home in the sport. Hell, we’ll even get a title shot, or at the very least a number one contenders fight. Here’s looking at you Chael Sonnen, Alistair Overeem, and Nick Diaz. At least Nate Diaz earned his shot because of what he did in the cage, and not by engaging in questionable activity outside of it. We as fans deserve to see title fights that are earned, not given. As I recall; Frankie Edgar wasn’t the popular choice to fight B.J. Penn. Fast forward 10 rounds, and a star was born. My point is that the fights won’t always be popular, but as long as it’s fair and well deserved, you won’t hear me complain. I know many of you will say that I hate the sport and all the people I named in this article, but nothing could be further from the truth. I have a very low tolerance for those who claim to love the sport but are involved in the holding the sport back so that it doesn’t get to the next level. The time has come for us to reward accomplishments inside the cage. The time has come for us to put more emphasis on what happens inside the cage, and less on what happens outside of it. The time has come for us to build the sport and not destroy it. I fear that if we don’t, my next piece could very well be titled “The Integrity of MMA Has Been Compromised”. Update that’s not really an update: Alistair Overeem is slated to fight “Big Foot” Silva, but he hasn’t even received his license yet! Amazing!!! (This is the guy you all want to see get the next heavyweight title shot). Fight Fans, Sound Off: Am I overreacting??? Like I said I like Nick Diaz as a fighter, and this fan made highlight reel of him is impressive.